There are several ways to create attractive contents over web. Your website has only seconds to capture interest. Think about articles you’ve read, speeches you’ve heard, books you’ve begun. The initial exposure helps people determine whether they want to spend more time reading, listening or viewing. There is simply too much competition for time to expect that people will invest too much of theirs in trying to overcome a tepid introduction. This post demonstrates how to repurpose existing content in a different media format, get more bang from your archives, and reach new and different audiences in the process. You have to be edgy, but not poke someone in the eye. You have to be willing to challenge and amuse, while not bragging or boasting. Your site, and particularly your homepage, should be provocative enough to be memorable and cause others to tell colleagues, “You ought to visit this site." 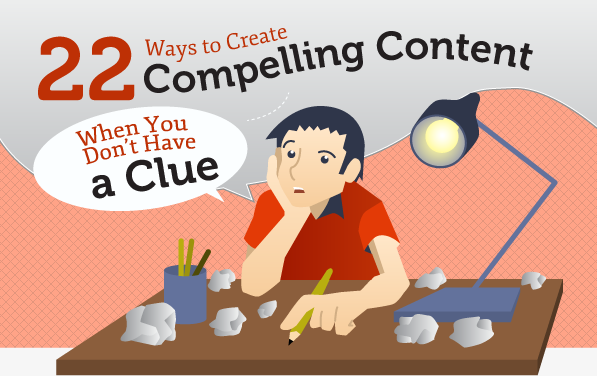 The following infographic from CopyBlogger shows 22 Ways to Create Compelling Content When You Don’t Have a Clue.